Fluorescent TrueBlot®, a new format of our popular TrueBlot® product line, combines the power and specificity of the original products with the versatility of fluorescent and near infra-red dyes. Conjugating highly optimized TrueBlot® reagents to a full spectrum of fluorescent labels, results in multipurpose reporter molecules that can be used in a variety of immunoassays. Immunoprecipitation assays and Western Blots provide highly specific results, yet often suffer from heavy/light chain blotting, contamination and ongoing interference. TrueBlot® products solve nearly all of these problems through increased sensitivity, less background noise, and enhanced accuracy. Fluorescent TrueBlot® can be used as secondary antibodies to detect target proteins in FLISA assays, flow cytometry, fluorescent western blots and other immunoblots, as well as analyze the distribution of proteins, protein modifications, and other antigen targets in immunofluorescent microscopy and immunohistochemistry. 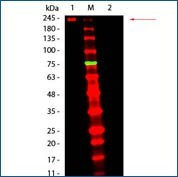 Highly optimized Fluorescent TrueBlot® provides pinpoint specificity while limiting background interference from non-specific binding. Infrared fluorescent dyes combined with NIR fluorescent imaging delivers enhanced sensitivity due to low background autofluorescence in the near-infrared region. Therefore, they have higher signal-to-noise ratios when used in immunoassays. TrueBlot® conjugates can also be used in multiplex assays; where several targets can be detected and imaged simultaneously, resulting in blots that show enhanced detection of distinct target bands labeled by a unique identifying color. Simultaneous detection helps cut time, while ensuring the target molecules are still easily identified.